Just when you thought there wasn't enough Michael Jackson news in your life...here's today's entry! 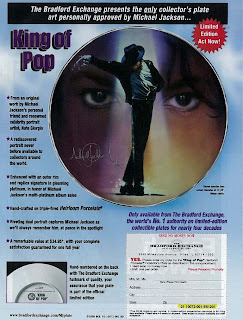 Nothing like a dead pop icon staring at you from a "limited edition" plate. I wonder if La Toya and her Psychic Network saw this coming. Thanks to Gallery fan Janine for once again opening my eyes to the scariness underlying our popular culture. I love how his face below the eyes is airbrushed away to become the backdrop...conveniently omitted the nose. Perfect match!